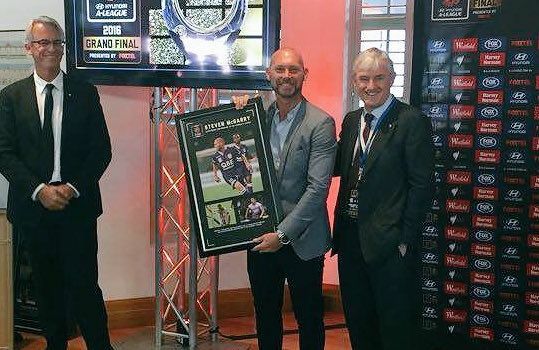 New ECU Joondalup midfielder and assistant Coach Steven McGarry has been in outstanding form for the club in the PS4 NPLWA this season, and on Sunday the Scotsman was recognised for his contribution to the Hyundai A-League with a presentation prior to the A-League Grand Final. McGarry, who played 114 games for Perth Glory after moving over from Scotland in 2010, was a special guest of the FFA at Sunday’s Grand Final between Adelaide United and Western Sydney Wanderers, and he was thrilled to be honoured, not just by the league but by the Professional Footballers Australia (PFA). The 36-year-old said it was honour to receive the award. “I was very honoured to receive recognition for my contribution to the A-League competition, and also recognition from my fellow players,” McGarry explained. McGarry will be in action again for The Jacks this weekend, when they take on his former club Perth Glory in Week eight of the PS4NPLWA at Ashfield Sports Club.